That's right! It's time for the Taylored Expressions "Blast from the Past" Blog Hop! I'm so excited to be a part of this fun event...so keep hopping and check out all the amazing creations from some oldie but goodie stamps! I wanted to showcase my all time favorite TE stamp set, Discover Your Wings! I love this landscape image with the floating butterfly! I inked up the stamp with Garden Green, Real Red & Summer Sun Stampin' Write Markers, then stamped the 'dream' sentiment in Black Stazon. After a few layers and nesties, my card is complete...and don't forget the ribbon & button treatment...LOL! This is such a happy cheery card with all those wonderful colours! This is beautiful! LOVE the touch of turquoise! You do wonderful cards with this set! Love the bright and fabulous colors you used! So cheerful! 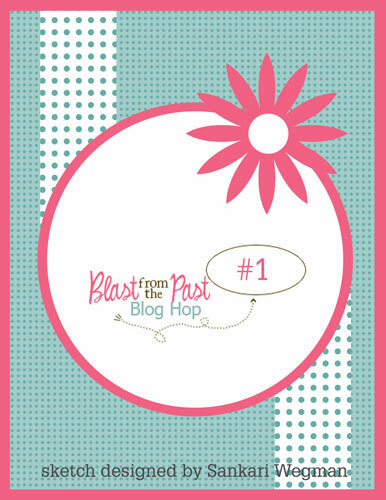 Thanks for playing in the Blast from the Past blog hop! Just love those flowers!! Fabulous card using the sketch and I love the bling you added to the butterfly wings - note to self on that one :D Great work! This is GORGEOUS Stacey! I ADORE the colors on this! Pure fabulousness!!! Love your card! Such pretty cheerful colors! Very pretty! 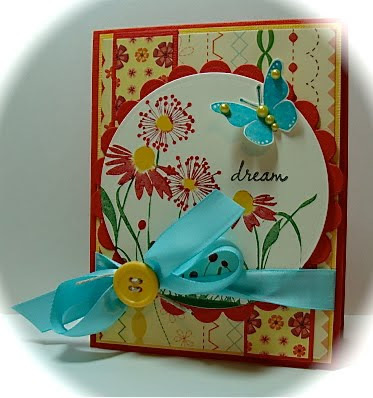 beautiful card- love the pearls on the butterfly; so glad you played in the hop with us! What a gorgeous card! I adore the colors you used! Wonderful colors!! what a bright and absolutely lovely card!! Gorgeous colours Stacey! LOve that butterfly! Gorgeous card and those colors are fabulous. What a cheerful card! Love it! What an adorable card...love your take on the sketch! So glad you were able to join the hop! Oh that is gorgeous!! LOVE those bright and cheerful colors!! I absolutely LOVE this!!! So bright and cheery. Way to go!!! LOVE this! The colors in the flowers really make the flowers pop off the paper! Wow Stac, this is lovely! The colors are so great. You did an awesome job on this card!